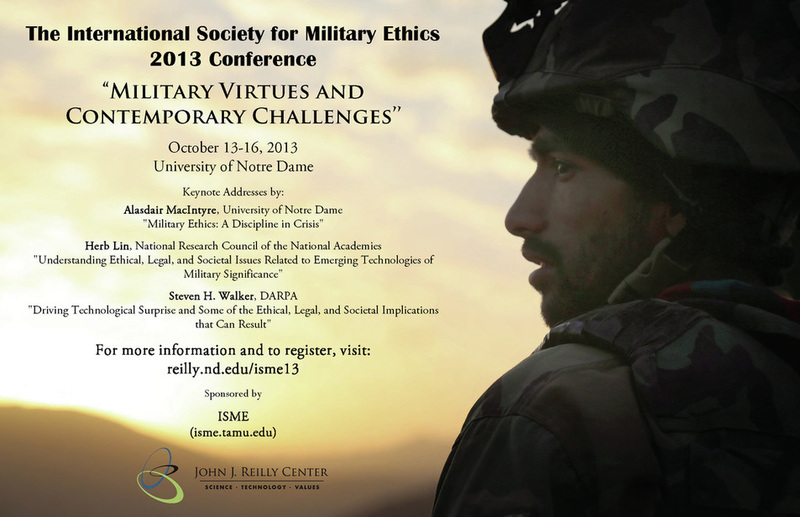 This three day conference took place Sunday to Wednesday, October 13-16, 2013 at the University of Notre Dame in South Bend, Indiana, under the auspices of Notre Dame’s Reilly Center for Science, Technology, and Values. Keynote Address: Alasdair MacIntyre, University of Notre Dame "Military Ethics: A Discipline in Crisis"
"Understanding Ethical, Legal, and Societal Issues Related to Emerging Technologies of Military Significance"
Abstract: Ethical, legal, and societal considerations inevitably accompany scientific and technological research and development, but most of the thinking to date about how such considerations should be handled has been limited to R&D in a civilian context. How and to what extent, if any, do similar considerations apply in a military context, and especially when rapidly changing and/or readily available technologies are at issue? This talk may be relevant to policy makers, funders of military and other national security R&D, and the scientists and technologists engaged in such R&D. "Driving Technological Surprise and Some of the Ethical, Legal, and Societal Implications that Can Result"